Draw a line under your profit margin this year, and hand out the ideal business gift to well deserved customers as a good will gesture. A customers desk shouldn't be without a short Short Promotional Ruler, and since stationery is a huge promotional market, its your chance to expose your brand name in a sleek and stylish way. Bespoke shaped with a customisable shape to your choice, a personalised digital print of your corporate crest, brandname and logo can be clearly printed to perfection. 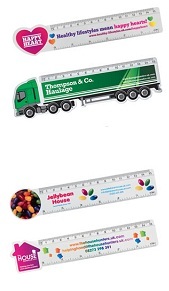 Customise your ruler to a bespoke cut of either a circle, heart, lorry or house shape to add to distinction.